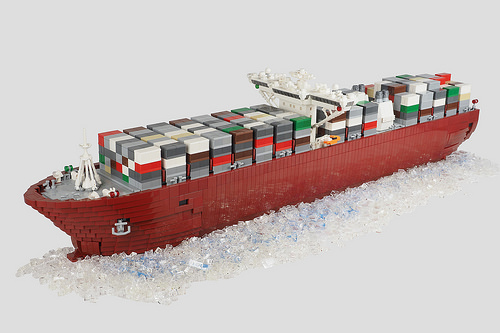 This impressive 3-foot long container ship by Jussi Koskinen can transport over 700 2×4 brick-sized containers from across your living room to wherever you need them. The use of the curved slopes helps create the gently curved contour of the hull, which is reinforced with a sturdy Technic frame that allows one to pick up the ship from either end. Smooth sailing ahead!